Kit is just back from the World championships in Weymouth where the Irish team came third this year and will no doubt be already planning for next years. So now over to Kit for his advice for his favourite species, tope. Thanks Kit….. 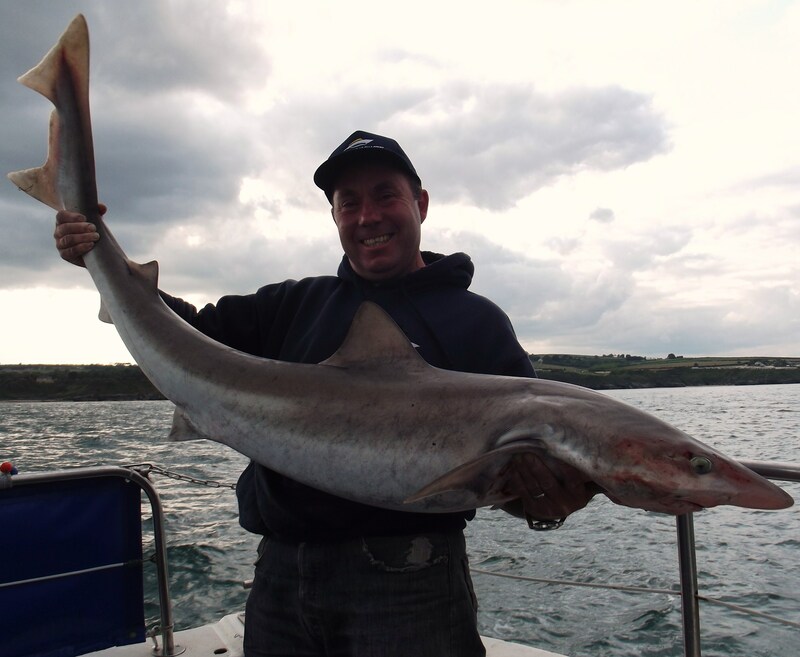 When Paddy asked me to do a piece for the webpage I was only delighted to oblige, and there was only one fish for my first article, Tope, what I consider to be my bread & butter fish. You see I grew up on Tope fishing; they were my first prize fish and are still my best prize fish. I have enjoyed catching these predators for 30 years and I can honestly say that the buzz of fighting one hasn’t diminished one bit in that time. 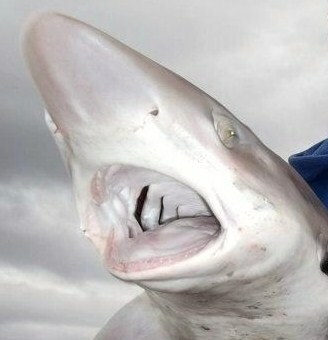 Identification: Shark-like fish, sleek muscular body, upper-body grey to brown or tope in colour, underside white. Females: Mature between 130cm and 185cm long at approx. 11 years old. The East coast of Leinster has developed a great reputation for tope, and rightly so, particularly in the last 3 years where numbers have grown considerably. Pack Tope numbers are growing with fish showing inshore and offshore in deep waters, while specimen size fish catches are on the increase and getting bigger. Ok a lot of this is to do with the introduction of my Charter boat business at Wicklow but regardless they were always there, now they are getting caught. Tope can be found hunting on the sandy bottom in or around the edges of most banks, channels, troughs, ridges and gullies. You may find these conditions from a half mile to 5 mile offshore. Check you navigational charts and GPS for coastal banks, buoys and deep troughs. Usually with these areas comes strong tidal flows and of course weather issues, you should always gather some local knowledge before setting off to try out your selected area. The inshore marks are usually home to big Females in late Summer / Autumn when they come in to pup close to shore and out of tide. Our Tope fishing would generally start in May, would improve a lot by June, continue through July, August and well into September. The pack tope, usually between 20 and 30lb weight can be found in numbers throughout the summer months, while you always have a chance of landing the odd specimen of 40-50lb among them. In late summer early autumn you have a chance of landing one of the larger females when they come close to shore in pup. 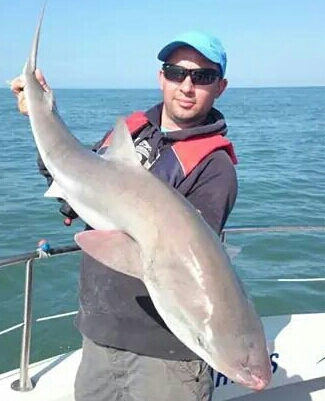 A “dawn raid” or a dusk trip can maximise your chances of tope and don’t rule them out at any stage of tide, these sleek animals can fight and feed in the hardest of tide – the problem is then bringing them up. 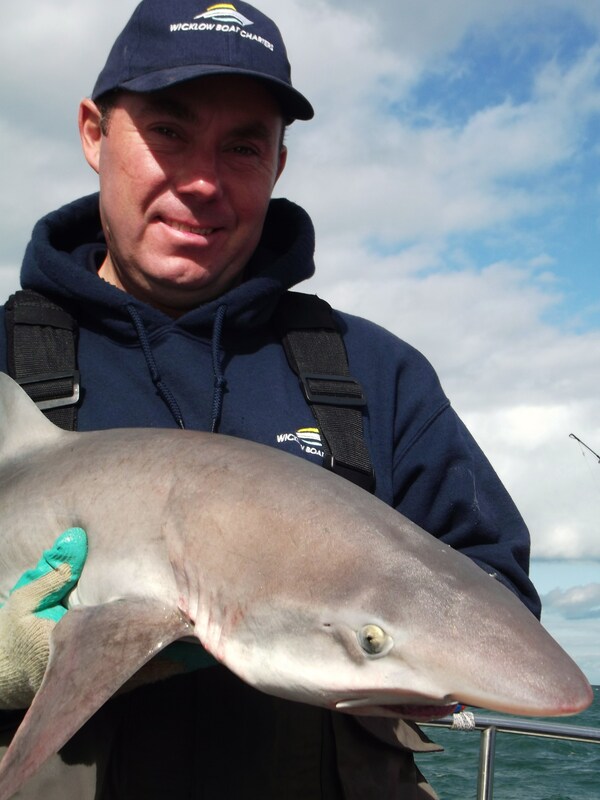 A lot of anglers think way too big for Tope fishing, I was the same when I started fishing. I now use an up-tide rod with a sensitive tip, or a 20lb class down-tide rod. I love my Penn multiplier reels for down-tiding but I’ve dropped from my 535 to the 525 loaded with 30lb braid. On occasions when I uptide I use my Shimano 10,000 long-cast fixed spool reel. This is probably as light as you can go with your gear on the East coast because of the strong tides. You should always have a good disgorger, strong and long just in case, something along the lines of ‘T’bar will do. Most tope should be hooked in the lip or surrounding area and the disgorger is the best tool for this. You may get the odd swallowed hook, in these situations you should use a long dowel like stick with a ‘V’ cut in the end or a long nose pliers and wire cutters if necessary. Keep all tools close to hand to avoid delays, the quicker the better for the fish. A single hook plain trace is perfect for tope fishing, 5-6 foot long is about right. 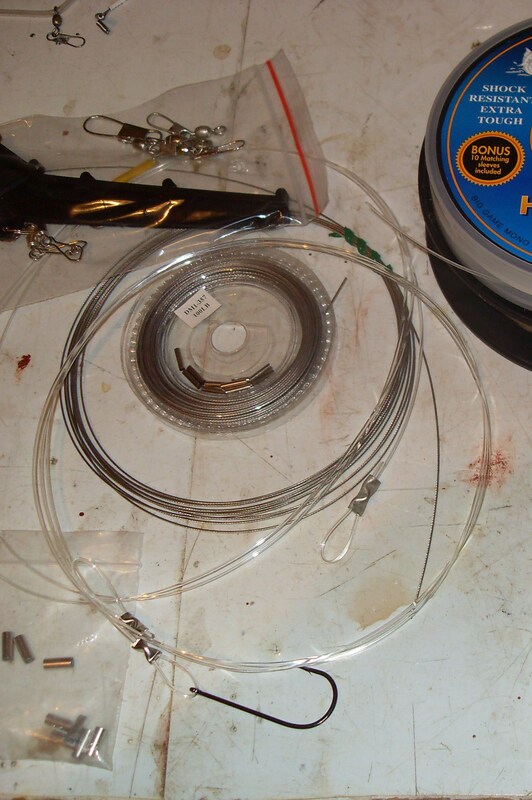 Using large crimps make a loop one end, and put a hook the other end, no attractors needed – just add bait. I use 150 to 200lb breaking strain mono, I find mono lasts better than wire which can get mangled after just one fish. Lighter traces can help if the fish are fussy but you must match this with lighter drag setting and a softer approach. A single 5/0 or 6/0 hook matched with big baits will usually work but can lead to some misses as the fish may take the bait and miss the hook. If you are missing many fish with a single hook rig then look at the bait presentation, make sure the hook point is always exposed, and try smaller baits. As a top predator Tope are best targeted with fresh bait, you can’t go wrong with fresh mackerel. On those odd days when Tope are fussy they may prefer a whole squid, mackerel/squid mix or a well presented herring flapper, sometimes when one bait is plentiful you can tempt the fish with something different. Launce, live pouting, fresh Pollock or small flats have all been used successfully. 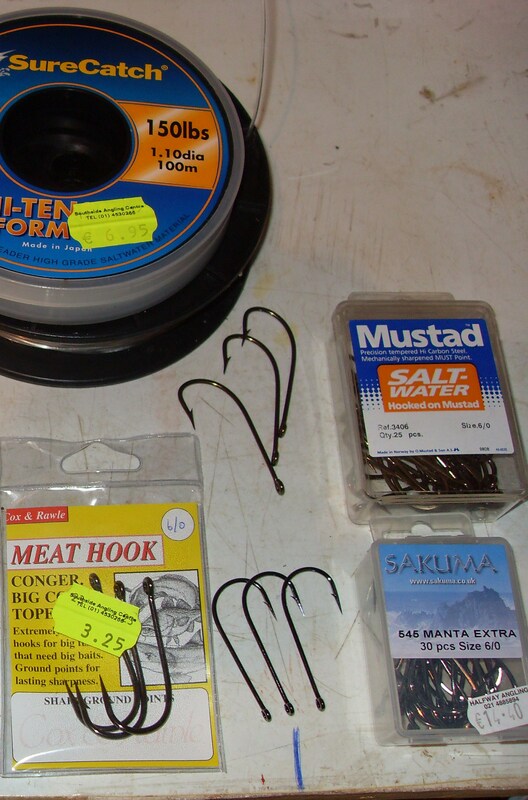 Bait presentation is very important and one method can work better than the rest each day, which one you never know. 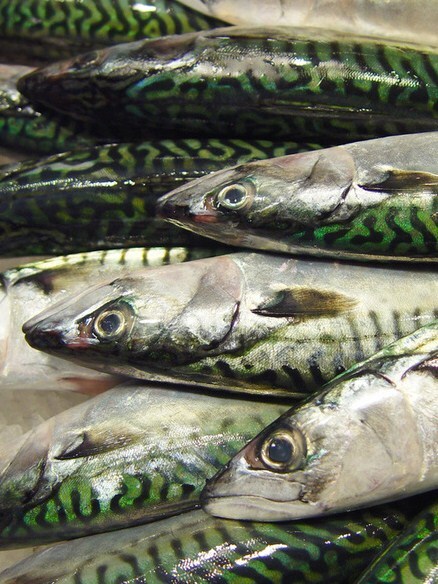 I favour smaller baits, I would diagonally cut a mackerel in 1/2 and use the head end. Whole fish can be good, use a small to medium mackerel and cut the tail off; you can position the hook at either end. I would always puncture the head and body several times to allow blood seep out. For the best blood output you can fillet a fish from the tail end and continue right through the head, then present it like a whole fish bait. 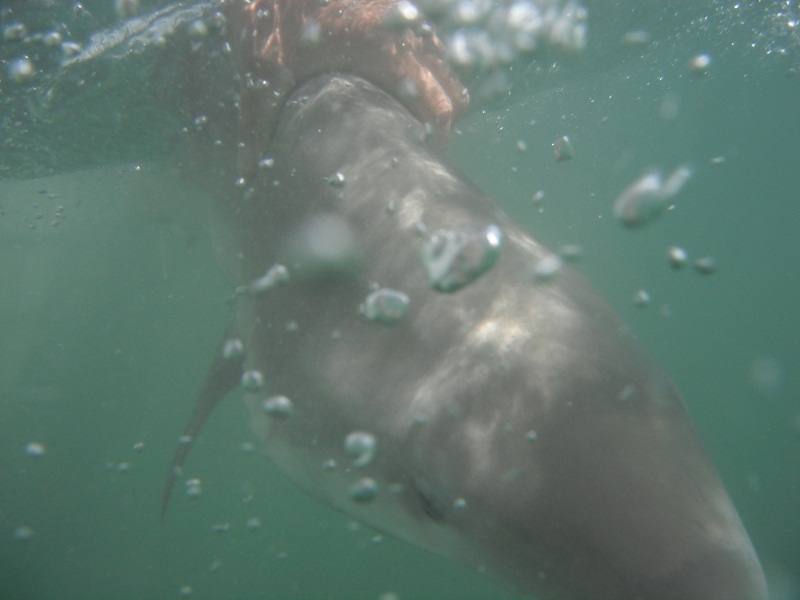 Scent trail is a big factor when tope fishing, after all they are a member of the shark family. I always leave one bait on the bottom to keep the fish in the area, even when someone or more than one person has a fish on. I honestly believe the single most important thing when Tope fishing is to make the fish believe there is nothing at the other end of the line, when a fish finds and picks up your bait he should feel no resistance. I say this day in and day out and still anglers leave the reel in gear and put the rod down on the gunnel, even with light drag set there is still resistance. I would always hold the rod in hand with reel out of gear, no ratchet on, and my thumb very lightly on the spool. I use the line running freely through a tuby boom, never a trapped boom. This keeps me in touch with the bait and allows me give line at every little touch so the fish feels no resistance from reel or lead. Sure we have all got Tope when we put the rod down but I believe you have a 50% chance that way and a 90% chance My way. When you feel the bite just let the fish pull line freely, he is checking out your bait. If you show him tension in your line he may drop the bait as quick. You must wait, let him take it and when he’s ready he’ll run, this is it – screaming reel. I would always try and let a fish run until he stops. When he stops you should wait again, give him a moment to take the bait into his mouth, and then reel into the fish, now the fun begins. When you make contact with the fish your drag should have been pre set correctly, so be strong and give a good lift to make sure he’s hooked, not a jerk or big strike. Reel fast and keep constant pressure on the fish, hold tight or pump if necessary without any jerking action. Don’t be tempted to push that drag up or even apply thumb pressure, I have seen many fish lost this way. If you miss or loose the occasional fish, don’t worry, even the most experienced Tope anglers will not hook and land 100% of Tope bites. Give plenty of time to fighting the fish letting him dive and tire, this gives you more pleasure and an easier and less stressful landing for the fish, on the flip side of this you don’t want a fish struggling for 40 minutes as it can cause a lot of stress. Expect your fish to make a dive or two on breaking the surface, after this he should be ready to land or un-hook at the side. You will need someone at the stern of the boat while you draw the fish up along the side, if the fish is tired enough and the hook accessible, he should be positioned on his back and the hook removed as quickly as possible outside the boat. The rod should always stay in touch with the fish, grabbing the trace at the side of the boat will usually loose fish. If it’s necessary to land the fish I find a large net the best method unless he’s too big, then grabbing by the tail or pectoral fin works well. Although it is preferred to keep the abdomen level and supported, lifting by the tail may be the only way to land a fish sometimes. When in the boat the fish should be held firmly and level in a manner which won’t damage him, remove the hook and return asap. I’m not a big fan of leaving hooks in fish although on rare occasions it could be the best option. Thankfully, I have yet to find myself in such a situation. 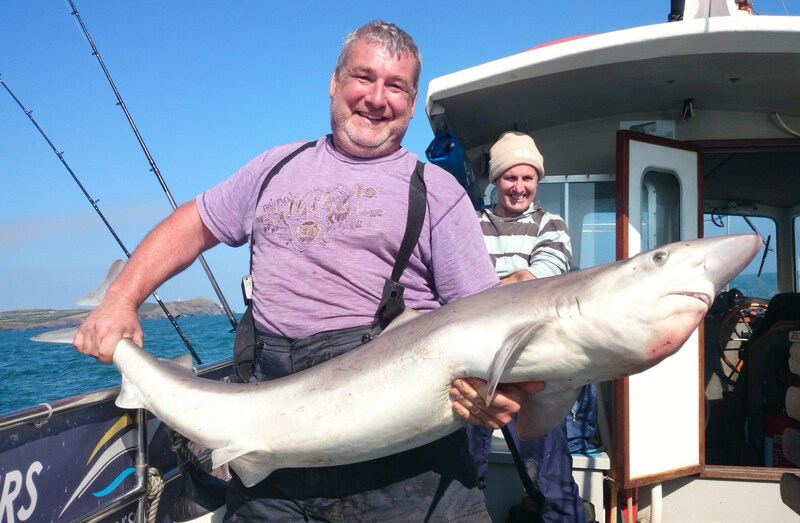 Having removed the hook with care, take a good look or a quick photo and enjoy the moment before lifting by the tail and fin and letting him swim away with his head into the run of tide. I tag a lot of fish now and I really believe it’s a worthwhile exercise, however, I will always consider how much stress the fish has been under before I delay it getting back into the water. Hauling a fish up against a strong tide can put a lot of stress on a fish and the sooner he’s back in the water the better. It may be necessary sometimes to hold your fish at the side of the boat, I use a heavy canvass shopping bag with the ends cut out, it works a treat. Always keep the scent trail active on the bottom, keep bait on the bottom even with fish on. Don’t rule out any bait, and try some alternative ones, blood is important so anything fresh can work. Keep it simple 5- 6’ long, single hook trace, no frills or attractors needed. If you are missing fish try smaller baits and smaller hooks, a heavy 4/0 is sufficient for pack Tope. 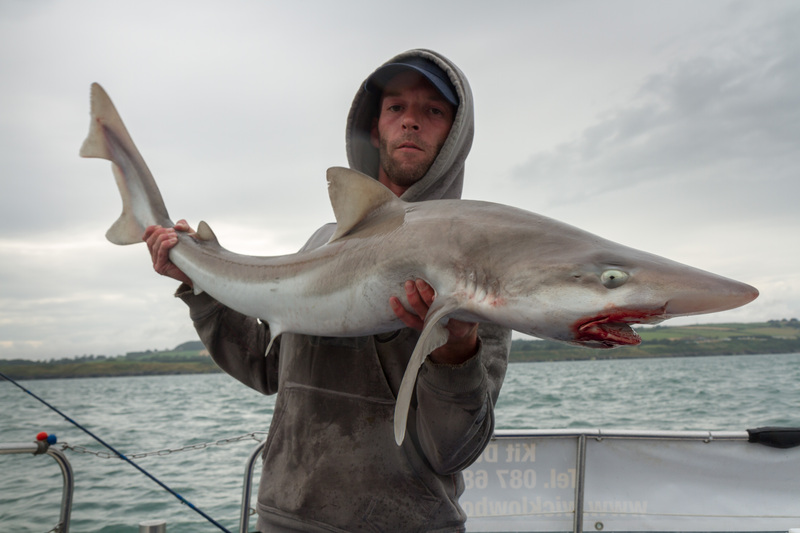 A lot of anglers think Tope are too big for up-tiding, not at all. It can prove successful especially when sharing the bottom with 7 other baits. 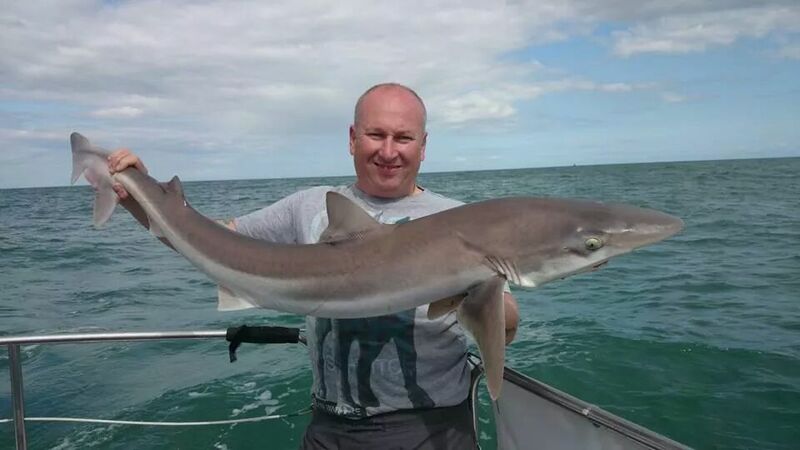 This entry was posted in Boat fishing and tagged tope. Bookmark the permalink.